Address: Avenida de Papagayo, 22, Playa Blanca (Lanzarote), Islas Canarias. 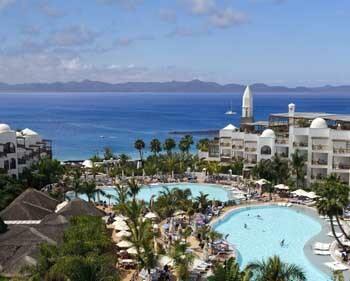 The Hotel Yaiza Suite Hotel Resort is set on the beachfront in Playa Blanca. This resort features 6 outdoor swimming pools, a Thalasso and spa centre, sports facilities and 8 restaurants. Each room at the Hotel Yaiza Suite Hotel Resort has a balcony or patio with sea views, or overlooking the pools or the gardens. All include a small kitchenette, flat-screen TV, and a bathrobe and slippers. Guests can enjoy the Thousand and One Nights seawater circuit at Hotel Yaiza’s Thalassotherapy centre for an extra charge. Hydro-massage jets, swan-necks, underwater music and color therapy are also available here, as well as a Turkish bath, treatment cabins, and a tea house. The fitness center has sports classes and a sauna free of charge. The restaurants at Hotel Yaiza Suite Resort serve buffet and individual choice cuisine. Mexican, Italian, Japanese and gourmet Spanish cuisine is offered within the resort. There is also a tapas and a poolside snack bar. Please note, children are defined as being 3 to 12 years old. Please indicate the amount of guests for each reservation. Any extra guest will result in a rate change, which must be paid upon arrival. Please note that the safe has a surcharge. Please note that there will be some renovation works behind the hotel's annex building until 31 July 2019. During this period, guests may experience some noise or light disturbances.